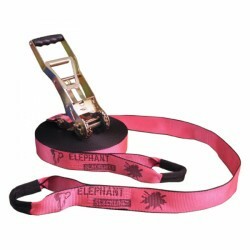 Elephant Slacklines feature a high-quality workmanship (made in Germany) and high safety components. While the rounded edges prvent injuries caused by cuts or abrasions, the straps (manually sewn) guarantee a long durability of the Slacklines. Loud neon colours make the Elephant Slacklines an eyecatcher and support the orientation due to the high contrast.